Tired of buying and upgrading software? Want access to dozens of programs in addition to the ones on your computer? It's as easy as signing up and you are good to go. Select not only chart wheels and services but also choose from a wide variety of state-of-the-art reports and then email them directly to your clients. Pay as you go, as the need arises. 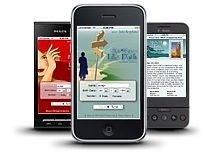 Order from your cell phone—from wherever you are! 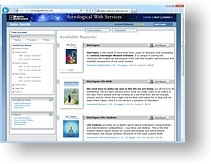 Web-based Astrological Services that give you all the Chart Calculation and Chart Interpretations that you need without purchasing a expensive desktop software. It's as easy as signing up and you are good to go. Select not only chart wheels but also choose from a wide variety of state-of-the-art reports and then email these directly to your clients. No sign up fee. Pay as you go—as the need arises. We have a dozen mobile apps for your iPhone or Android, including a full-scale transit report that you can access 24/7 from your smart phone. Web-based calculation and interpretation service. PDF natal, transit, progression, direction, and solar and lunar return charts. Several chart styles: Standard, Unequal, European or Aries. 25 most popular reports with Pay as you go Service. Web mobile full-scale transit report.